This is Julie's beautiful home. I came over today to take some photos of her new Pink Pagoda prints. They actually came a while ago and she had been day dreaming about hanging them for a while. And so three months later...Voila! It was worth the wait. They look beautiful in the thin blue frames she chose, and of course, her styling is flawless. I love all the green and purple accessories she added. 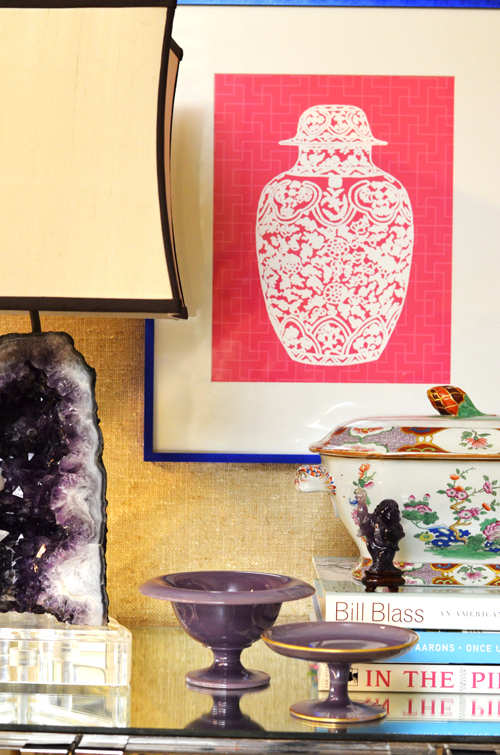 These chinoiserie prints liven any corner up instantly with their classic themes and bright colors. They are an inexpensive way to add a pop of color to your home. 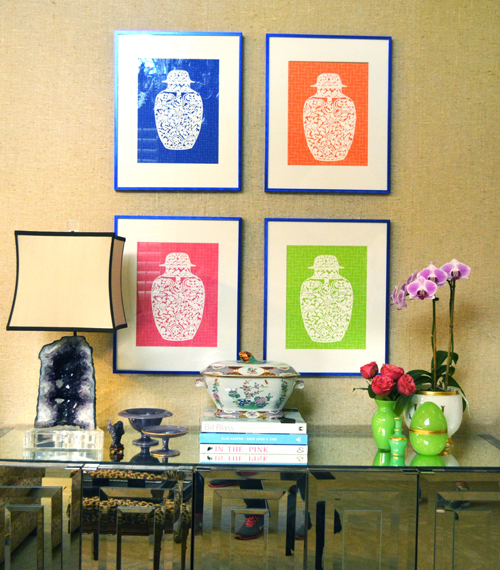 Here you can take a look at other homes that also have Pink Pagoda prints to get ideas. My favorite are the three monkeys in the gallery wall in the laundry room. Take a peek. 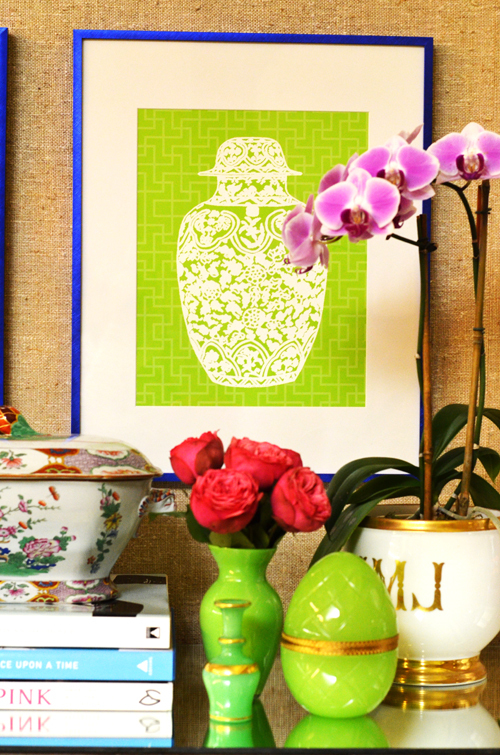 I have very few chinoiserie pieces in my home...but I'm digging these prints. How about you? 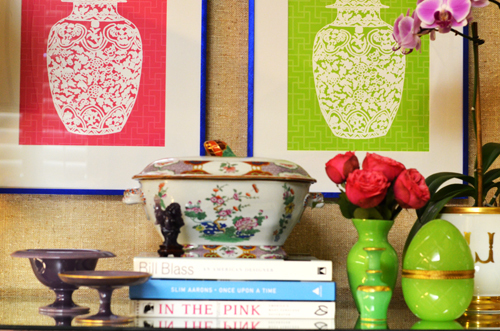 I love These chinoiserie prints! The royal blue in the frames is just perfect! They work very well with all the decor pieces in the table. Gorgeous! Incredible styling as well!! Jennifer- thanks for stopping by....those prints have been a hit. Hi, I'm here from TPP. I love how you framed the prints in blue. It is so lovely, and your styling looks great! I came over from The Pink Pagoda! Those prints look GREAT!!! And I ADORE that lampshade! Did it come WITH the lamp or was it a separate purchase? Thanks for all these great comments. I actually designed the lamps. The shades were bought at the Arteriors outlet store here in Dallas. Thanks again to Jennifer for the shout out.